The K-5 Religious Education Program at St. Anne Parish strives to catechize our children about the Catholic faith, to develop and strengthen their relationship with Jesus Christ, and provide a strong base for their life-long journey of discipleship. The program also includes formation and preparation for the sacraments of Baptism (when applicable), First Reconciliation, and First Communion. This is typically done in a classroom setting using a variety of teaching techniques. 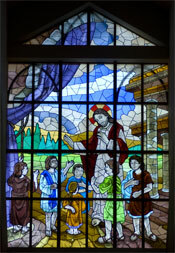 Grade 1-5 lessons are based on the Alive in Christ textbooks from Our Sunday Visitor. Kindergarten uses leaflets from the Allelu! program. Students attend for an hour once a week, mid-September through mid-May. Classes are offered on Monday, Tuesday, and Wednesday with two sessions each night at 4:30 and 6:00 PM. We do our best to honor your preference for day/time but may not always be able to accommodate your request if a session is full. Classes are assigned first come, first served when registration begins over the summer. – It is expected that students be enrolled every year (grades 1-8) to learn all that they need to know about their faith at every age. Note: Kindergarten is also offered and encouraged. – Parents are the first and most important catechists in a child’s faith formation. Please attend Mass as a family each week, pray together and practice reciting prayers, review the RE sessions at home each week, and share your own faith story with your child. – Review the 2018-2019 RE Handbook on the Parent Page for further details of our program expectations. If your child misses class for any reason (such as illness, emergency, weather, holiday breaks other than Thanksgiving and Christmas) please use the appropriate grade level lesson schedule below to determine which chapter/lesson to do at home to stay caught up. Note that completing make-up work is strongly encouraged for all grades but required for grades 1 and 2. Go over the lesson with your child and have them complete the chapter review. The following week your child should show their catechist the completed review. Any child over the age of seven who is not yet Baptized can prepare for the sacrament through the RE program. Details of the preparation process will vary based on the child’s age and religious background. 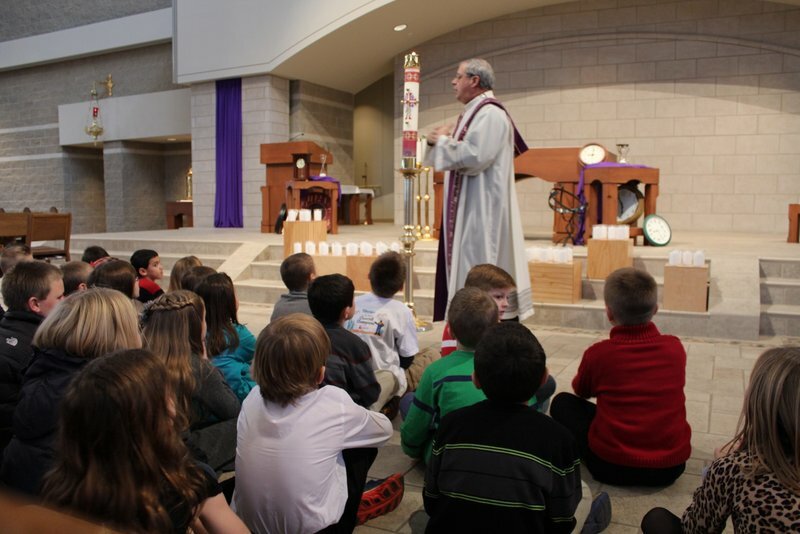 Preparation for First Reconciliation and First Communion is a two-year program. This is typically in grades 1 and 2, with Reconciliation being celebrated in November/December and Communion in April/May of 2nd grade. Children in grades 3-7 who have had no prior religious education must attend RE classes with their age-mates to learn the basics of the faith. 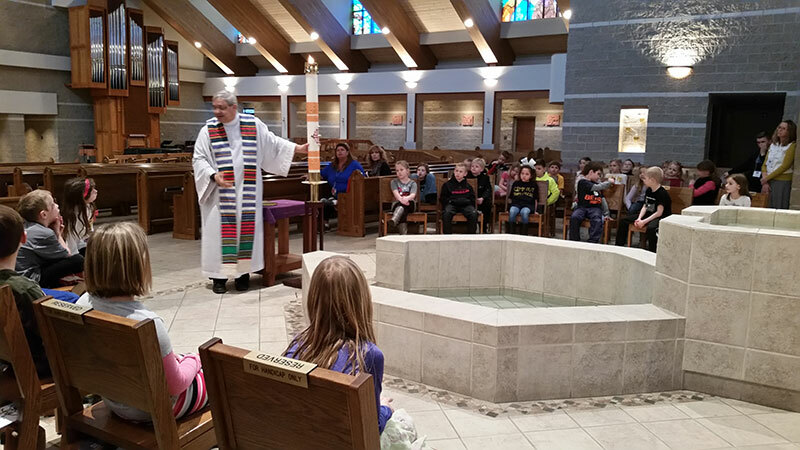 In addition, they must attend sacramental preparation classes on several Sundays throughout the year to prepare for First Reconciliation their first year, and First Communion their second year. For Sacramental Formation, you can click here to go to our SACRAMENTS page. We are all special in God’s eyes. Having a disability does not mean that a person doesn’t have gifts to share. At St. Anne Church, we want all our parishioners to have the ability to learn the Catholic faith, to grow in their relationship with God, to receive the sacraments, and to love and serve the Lord. Our Religious Education SPICE program strives to make this possible by providing extra support in our regular RE classrooms and/or working with students one-on-one or in small faith groups as needed. If you have a child with special needs, please contact the Religious Education Office and we will work with you to make the best placement and adaptations for your child. This group meets once a month throughout the school year and invites teens with special needs to explore and deepen their faith through discussion, prayer, activities, and service. Please contact the Religious Education Office if you have a teen who is interested in joining the group. Any teen (ages 13-21) with any special need is welcome, whether they have received their sacraments or not. Many volunteers are needed for our SPICE program to be successful. We need people to serve as SPICE Catechists and Aides, as well as Teen SPICE Leaders. Liturgy of the Word for Children is offered during the 9:15 AM Sunday Mass year-round for children in Pre-School through 1st Grade. The children are dismissed from the Church after the Opening Prayer to process to the Chapel to participate in the Liturgy of the Word using child-friendly language. During the Presentation of the Gifts, the children return to their families in the Church for the remainder of Mass. Please note: Children preparing to receive their First Communion and those who have already received First Communion should remain in the Church for the entire Mass rather than attending the Children’s Liturgy. Thank you. Join a Team and Spread the Gospel! Although it is the goal of St. Anne Parish to offer Liturgy of the Word for Children every Sunday, that is only possible when we have enough volunteers. Please consider joining a team of adults who work together using the provided Leader’s Guide to present the readings, a mini “homily,” and the Prayers of the Faithful in language the children can understand. The commitment is about one Sunday per month. A four-day program, 9 AM to Noon, held annually in June for children in Kindergarten through Grade 5. Adults and youth Grades 6 or older participate as volunteers. Participants learn about God’s love through crafts, games, skits, music, snacks, and bible stories centered on the year’s VBS theme. Our children’s library is located in the Joachim Center. At the current time we have selections that deal with Scripture, Saints, prayer, story books, and other titles that are sensitive to major issues that children in the elementary grades sometimes must face. We also have a few puzzles and VHS/DVD videos available for check-out. Families are welcome to use the books and puzzles while in the Joachim Center and/or to check out books, puzzles, and videos to take home for a few weeks.